In recent years, Hitachi's finger vein authentication technology, which identifies individuals by the unique pattern of blood vessels inside their fingers, has helped beef up the security of devices ranging from ATMs and cardless payment systems to computers and automobile ignition systems. Now this biometric technology is heading to the gym. 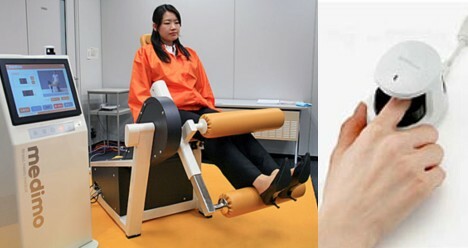 IT company Fukui Computer has unveiled a new line of networked exercise machines, called "medimo," that are equipped with Hitachi finger vein readers. When users identify themselves with a simple press of the finger, the machines respond by automatically adjusting the weight resistance and seat position based on the user's previously set preferences. The machines also connect to a remote server to retrieve the user's personal exercise data -- including previous exercise records and stats, training regimens and calorie consumption data -- which shows up on a touch-screen display. Users can then do their workouts based on this data, which is updated each time a machine is used, or personal trainers can refer to it when providing exercise advice. Fukui, who unveiled the 12 new medimo machines on February 18, plans to begin selling them on April 1 for about 1.8 million yen ($17,000) each. The company is targeting fitness gyms, hospitals and welfare facilities, and is expecting to sell 2,000 machines over the next 3 years. They've had ID number based systems like this for a long time. I don't think adding biometrics to the process is very useful.